Unusual architectural features: wood wall cover, scored as if stone; corner quoins; front entrance w/sidelights; hip roof; 2 interior chimneys; 2 wings of plain clapboard; 2 porches, probably later additions; "gingerbread" facade; windows to floor on first story. Much of High Vale Lane was developed in the late 1870's but this home predates most by thirty years and may have been the third built on the bluff above the Shawsheen River with a view of the mills below and the village that would emerge soon after. This property was owned by John Marland in 1848 and was lot #21 on his plan of property on High St. Marland sold the lot to Enoch Lewis of Andover, a gentleman, wife Charlotte S. Lewis. The deed states $1. was paid for the lot on Jan. 25, 1848. but no mention of buildings, only the Stone cottage next door. Lewis may have built the home as the following year he sells the property, with buildings to William Lewis King, of NYC on on Oct. 10, 1849. King owns for five years selling on Apr. 13, 1854. to Alfred Kittridge, of Haverhill, MA for $2500. Kittredge then sells the home to Edmund Benzon [sic], of Boston, a Merchant, that day for $2250. This sale is in the form of a mortgage, which Kittridge agrees to pay back in nine years at $250. per year plus interest. Later deeds referred to it as the "Burgon" House, "Benzon" House and later the "Benson" House. 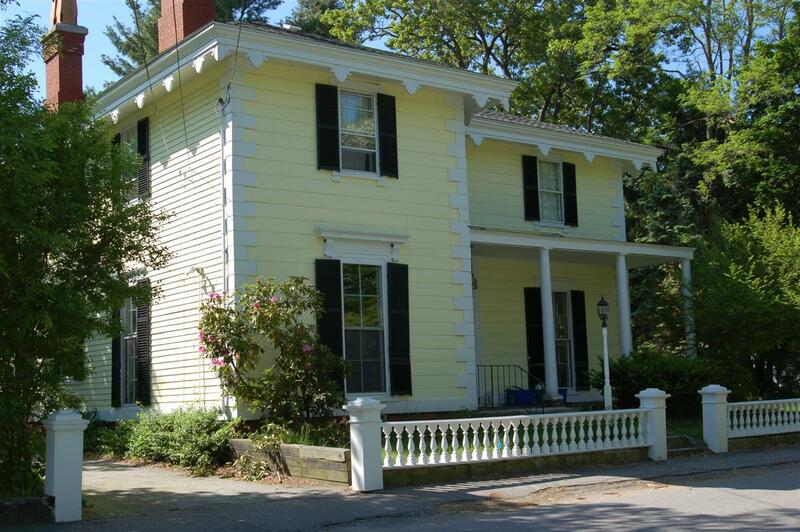 Alfred Kittredge owned the home in 1861 and took a $2000 mortgage on the property from John Ordway of Hampstead, NH on June 22, 1861. Kittridge became insolvent and began selling off his holdings in Ballardvale. Alfred sells the home to William P. Pierce on Mar. 17, 1864 for $1500 which includes to assume the mortgage loan of $2000 owed to Ordway. Kittridge also states in the deed "the dwelling now occupied by James M. Fessendon". William Pierce held the property for two years then selling to the Whipple File Company on March 20, 1866. Whipple File & Steel Manfacturing Co. declared bankruptcy in 1869 and Edward Page, John W. Beals, Thomas J. Homer of Boston and Thornton K. Lothrup of Milton, MA became the Assignees of the Company holdings. Their job was to sell off the assessts that remained. John Ordway called in his mortgage loan and on July 8, 1869 took possession of the property. Henry M. Haywood purchased the house on May 26, 1870 for $125 from Edward Page and paid off the Ordway loan of $2300. The deed now states the home "lately occupied by James M. Fessenden" Haywood would own the property the next 30 years. Haywood then sells to John K, Abbott of Somerville, MA who then sells to Addison P. Wonson of Gloucester, MA on May 26, 1900 for $4000. The property now includes 15 acres 132 rods of land extending eastward to the old Andover-Wilmington Railroad line. Enoch Lewis, wife Charlotte - Jan. 25, 1848 - b. 203 leaf 142 -$1. Edmund L. Berzon, of Boston - Apr. 13, 1854 - b. 493 leaf 176 - $2250. William P. Pierce - Mar. 17, 1864 - b. 664 leaf 245 - $1500 + mtg. Susan Story Wonson estate, 1960, Oliver Ladd Ames Admin.